I consider myself an avid fan of the original Nintendo Wii, when the platform first launched back in 2004 I was blow away by its innovative new game play and I wrote the console an overwhelmingly positive review. So imagine my delight when I was invited to attend a hands-on demonstration of the new Nintendo Wii U GamePad at the September 13 Nintendo press conference in New York. What is the Nintendo Wii U GamePad, you ask? Wii U is the new console from Nintendo, and the Wii U GamePad is an accompanying new controller that looks like a small tablet bordered by joysticks and selectors. It has a screen that measures 6.2 inches in the center that can be used to display games you’re playing on TV, maps of games your playing, or even a game that’s not being displayed on the screen. That’s right; you will be able to play a game on the controller, even if some one’s watching a TV show! The touchscreen can be used with your finger or a stylus, and it does come with the stylus, which is nice. The stylus makes it a lot easier to write on the screen, especially for some one with large fingers like myself. On the left side of the touchscreen is a depressible joystick and the plus symbol control pad for use in navigation as well as game play. To the right of the touchscreen is another depressible joystick. Below the right joystick are the classic button suite: A button, B button, X button, and Y button. Below the screen are some other buttons, including Home and TV; the latter is used to control your TV in order to adjust sound, picture, and the like. The Wii U GamePad also has trigger buttons on the underside and the outer edge. Above the touchscreen is a camera and microphone, using which you can engage in video and voice chatting with friends. It’s got a stereo speakers, as well as a headphone jack. For the inner workings of the Wii U GamePad, it has both an accelerometer and a gyroscope, as well as a geomagnetic sensor. These are used for motion control of games, as well as other functions. The GamePad also has the rumble feature, a standard of Nintendo controllers as far back as the Nintendo 64 console. This, of course, is used to give feedback to the user, based on action in the game. Wii U utilizes internal flash memory. The Basic Set will have 8 GB, while the Deluxe Set will have 32 GB. The computer processing unit, or CPU, is based on an IBM Power chip, in the form of a multi core processor. The graphics processing unit, or GPU, is based on an AMD Radeon HD chip. There are 2 GB of RAM; one GB for system memory, and one GB for game memory. This results in 20 times the memory than that of the original Wii. 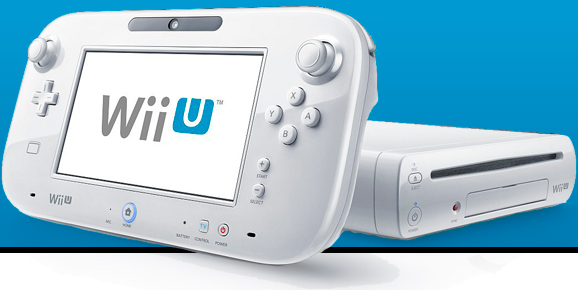 The Wii U console will be available in two iterations: a Basic Set white version, and a Deluxe Set black version. Both have AC adapters for the the console and the GamePad, as well as the sensor bar and an HDMI cable. The latter has a cradle charger for the GamePad and a stand, while the Basic White version does not. The stand makes it possible to set up the GamePad vertically on a flat surface like a table. The functionality of the Nintendo Wii U GamePad goes beyond normal game play. For instance, the TVii function allows the user to search for and watch movies, TV shows, and sports. You can use the Wii U GamePad to look for shows on a guide similar to the channel guide on cable or satellite. You can then choose to view the current program, or set it to record on your TiVo DVR. You can search programming on your TV provider, as well as On Demand in HuluPlus, Netflix, Amazon, and YouTube; or even shows you’ve already recorded on your DVR. You can watch on your Wii U GamePad what is being displayed on your TV, or you can view adjunct programming related to what your watching. For example, say you are watching a football game on TV. You can also watch it on the Wii U GamePad, or you can view a diagram of the plays. You can check out current scores of other games or stats of certain players for your fantasy football league. If you want to communicate with friends while you’re watching, you can use the Wii U GamePad’s virtual keyboard to type messages, and then send them directly to your friends via email, Twitter, and other social networking. Another great thing about the Wii U is its backward compatibility. Almost all of the games that currently exist for Wii do play on the new Wii U console. Furthermore, the existing remotes, including the Wii Remote, the Wii Remote Plus, the Nunckuk, and the Wii Balance Board are all compatible with the Wii U unit. Making the Wii U a must buy! Nintendo has also introduced a new gaming community called Miiverse, which is directly built into the Wii U console. Through this you can talk about games and content with game players from around the world. Utilizing your Mii character in the Miiverse, you can find applications, entertainment content, or games that you have viewed recently, or have indicated that you want to learn more about. You can ask your friends to play together, or you can make queries about an arduous level in a game, or even find new aspects of games you never knew about. If you want to share something, you can pause the application or game, and post in the Miiverse community. 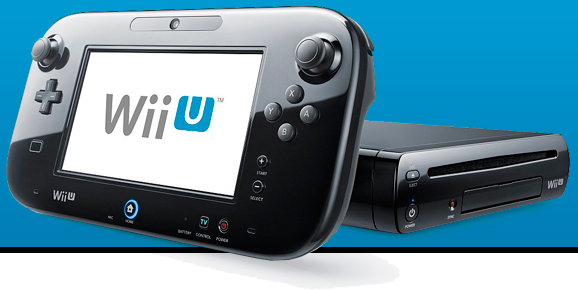 Now you know what the Nintendo Wii U GamePad is, so I’ll tell you what I thought of it in my Wii U Review. First, the GamePad is diminutive enough for the hands of a child, and it feels pretty light. It comes in at around 1.1 pounds. The plastic construction feels a little thin, and less substantial than I expected. The analog joy sticks enabled me to more accurately aim for first person action games, as opposed to the more difficult control of some of the traditional Wii shooter games. I like the ability to play games solely on the GamePad, but this feature only works with some of the games on the new system. The reason is some of the new games utilize the screen on the GamePad for maps and other information in the game. I am also curious about the cost of a second GamePad, because Nintendo has said that two GamePads would be supported by Wii U. However, there has been no mention of what the cost would be for a second GamePad. Just to note, a stand alone GamePad has been priced at $170 in Japan. I also wonder about DVD and Blu-Ray support. Wii U discs can contain as much as 25 GB of data, much like a Blu-Ray. However, Nintendo has made no mention of support for DVD and Blu-Ray, so it remains to be seen whether this support will remain. The list of approximately 25 games that are rumored to be available at the launch does look impressive, including Aliens: Colonial Marines, Assassin’s Creed, Batman: Arkham City, Call of Duty: Black Ops II, Ghost Recon Online, Marvel Avengers: Battle For Earth, Splinter Cell 5, Your Shape: Fitness Evolved 2013, and New Super Mario Brothers Wii U. One game I played that I really liked is ZombieU. It was one of the more violence themed games made for any console at E3 2012. It is a first person shooter that uses the touchscreen as a scope for aiming, as well as a tool for investigation throughout the game. This is one of those games that will not have the ability to play on the GamePad alone. Nintendo states that more games will be available during the launch window from November 18, 2012 to March 31, 2013. These include NBA 2k13, Madden NFL 13, Warriors Orochi 3 Hyper, Wii Fit U, Just Dance 4, Zumba Fitness Core, Rise of The Guardians: The Video Game, 007 Legends, and Transformers Prime. All in all, it is a pretty impressive array of games and fitness software. In conclusion, I like the way the GamePad feels in my hands. It is lighter than I thought it would be, but the workmanship feels solid nonetheless. The joysticks are both very easily accessible, and the triggers are in the perfect place. The location of the A, B, X, and Y buttons feels good, being just below the right joystick. The action on the joysticks is very smooth and precise. Because the stylus is stored on the back of the GamePad, it is out of the way, but never far when you need it. The display seems big, but not overly so. There was no lag time between images displayed on the TV, and those on the GamePad. As big as the GamePad is, it never felt unwieldy, even when I used it in one hand when I played New Super Mario Brothers Wii U. Will I buy Wii U? I am ready to order Wii U online right now, so as soon as they have Wii U in stock on November 18, they can ship me my Nintendo Wii U!! Bellow I encourage others to post their experiences and feed-back on the exciting new Wii U consoles and GamePad device.